We understand the essential safety considerations and our customers demands for the best value. Huge stocks from leading manufacturers plus a comprehensive selection of great value budget brands and others ensure that you can rely on Tyldesley Tyres and Exhaust to have the right tyres for your motoring needs. All our tyres come at unbeatable competitive prices. Nearly twenty years of experience, an enormous range of in stock exhaust parts coupled with our expert friendly staff with their extensive knowledge of all things exhaust should make Tyldesley your first choice any time you have an exhaust problem. Our catalogue lists over 6000 exhaust sections to ensure we have the parts needed to keep your car on the road. Every car over three years old requires an annual MOT test. Some customers dread this event. It needn’t be that bad. If your car is properly maintained the test should not present any great problem. At Tyldesley we’ll be pleased to carry out the MOT test and, if necessary, we can undertake any repairs your car may need. 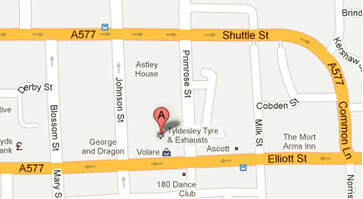 Book Early: Our MOT bay is always very busy, especially at the end of each month as road tax may become due. It takes around 45 minutes to do each test so we operate an appointment system to avoid excessive waiting. As the MOT test can be done any time in the month before it expires without loosing any time on the new certificate we suggest you book up early to avoid last minute panics. 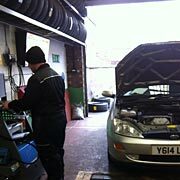 We are now providing Engine Diagnostic and Air Conditioning Solutions including fault diagnostic, regas and servicing. Whatever work you may need dong on your vehicle we can help, tyres, exhausts, servicing, shockers, tracking, balancing, brakes etc.